South Africa has denied the Dalai Lama a visa to attend a peace conference linked to the 2010 Football World Cup, which the country is hosting. Archbishop Desmond Tutu has pulled out of the meeting in protest and branded the decision "disgraceful". A government spokesman has denied suggestions that the ban was a result of Chinese pressure. He said he did not want anything to distract from South Africa's hosting of the World Cup. 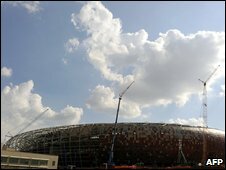 The Johannesburg conference is intended to discuss football's role in fighting racism and xenophobia. Mr de Klerk has also withdrawn from the event, while Mr Mandela's position is not clear. "It is disappointing that South Africa, which has received so much solidarity from the world, doesn't want to give that solidarity to others," Nobel Institute Director Geir Lundestad told the Associated Press news agency in Oslo, referring to the decades-long fight against apartheid. Presidential spokesman Thabo Masebe said the conference organisers had not consulted them before inviting the Dalai Lama. "The South African government does not have a problem with the Dalai Lama," he told the local Sapa news agency. "But at this time the whole world will be focused on the country as hosts of the 2010 World Cup. We want the focus to remain on South Africa. "A visit now by the Dalai Lama would move the focus from South Africa onto issues in Tibet." Speculation has also been rife that South Africa does not want to jeopardise its bilateral relations with China, one of its major trading partners. "We are shamelessly succumbing to Chinese pressure," Archbishop Tutu was quoted as telling the Sunday Independent. "I feel deeply distressed and ashamed." A spokesperson for the Dalai Lama told AFP news agency he was "very disappointed" by the decision, also accusing South Africa of caving into "intense pressure" from Chinese authorities. South Africa is China's largest trading partner in Africa, with 2008 trade standing at 100bn rand ($10bn; £7bn). Dai Bing, an official at the Chinese embassy in Pretoria confirmed to Sapa that Beijing had warned the South African government that allowing the Dalai Lama into the country would harm bilateral relations. Local newspaper, Business Day, quoted an unnamed government official as saying: "The Chinese government would not have been happy had we let him come... We would not do anything to upset the relationship we have with China." But this was denied by Mr Masebe, who said China had played no role in the government's decision. Beijing says the Dalai Lama is pushing for Tibetan independence, and has stirred up unrest in the region. 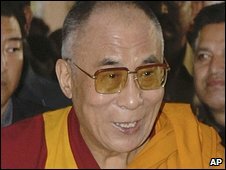 But the Dalai Lama, who fled to India in 1959 during an uprising against Chinese rule, has said he only wants limited autonomy for his homeland. The refusal has also drawn criticism of the government from South Africa's opposition groups. Independent Democrats leader Patricia de Lille accused the government of hypocrisy, and says the episode shows that there is no consistency in the country's foreign policy. Democratic Alliance spokesperson Tony Leon said the decision "flies in the face of all logic", Sapa reports.